Link to Maps of Norka and the Volga German settlement area relative to the discussion that follows. Norka (норка in Cyrillic script) was situated on the Bergseite (the hilly west side) of the Volga River, about 65 kilometers (40 miles) southwest of the city of Saratov. Saratov is located about 750 kilometers (450 miles) southeast of Moscow. Saratov (Саратов in Cyrillic script or Saratov or Saratoff in German) is also the name of the province in which Norka is located. ​Saratov Province is part of the vast Eurasian Steppe and originally encompassed all of the original Volga German colonies. 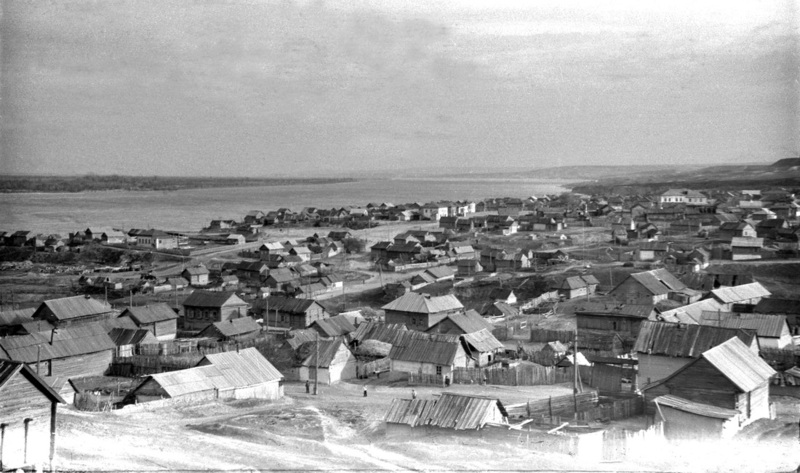 In 1851, the portion of Saratov Province lying east of the Volga River became part of the newly formed Samara Province. The geographic coordinates of the Norka colony are 51° 09' North latitude and 45° 18' East longitude. Norka is about as far north as Saskatoon, Canada with a similar climate and growing season. Norka panorama looking from north to south through the center of the colony. Photograph courtesy of the Oregon Chapter of AHSGR and used with their permission. At its founding, the colony was named Weigand (also Weigandt). This name was given in honor of the first Vorsteher (leader), Johann Conrad Weigand. While traveling from their homelands to the lower Volga, each group of colonists was headed by a Vorsteher and this person's name was often preserved when the colony was founded. In this case, "the colony of Vorsteher Weigandt." According to Peter Sinner, on February 26, 1768 the Russian government issued an order that all of the German colonies be given a Russian name. With the exception of 8 colonies, out of the original 104, the colonists continued to use the German place names. The colony of Weigand was one of the exceptions and it is likely that from this early stage of settlement, Norka became the accepted name. According to Jacob Dietz and Igor Pleve, Kolonie Norka (the colony of Norka) was named after the river that forms its northern boundary. The Norka River originates two to three kilometers west of the colony. At the time of settlement, the land surrounding the river was covered by tall grasses, shrubs and scattered forest areas. The early settlers told stories of vicious dog-sized animals who lived along the banks of the river. These animals lived underground and were plant eaters. Legend has it that these animals sometimes attacked chickens, ducks and even small children. Local Russian peasants called these animals "Norka" (норка), which in their native language is the name for the European or Russian mink. Norka was officially renamed Nekrasovo on July 2, 1942 following the deportation of all ethnic Germans to Siberia and Central Asia in the summer of 1941. Presumably the current name is in honor of Nikolay Alexeyevich Nekrasov, a Russian poet, writer, critic, and publisher, whose deeply compassionate poems about peasant Russia won him Fyodor Dostoyevsky's admiration and made him the hero of liberal and radical circles of Russian intelligentsia. Today the village is located within Saratovskaya Oblast (Saratov Province) and its postal code is 412833. 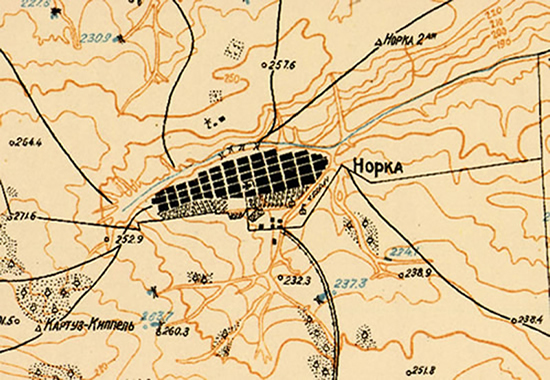 1935 contour map of Norka showing the street layout, church location and other geographic features. Located about 25 kilometers (15 miles) to the east of Norka was the colony of Beideck (Talovka) which is located on the main road connecting Saratov and Volgograd (formerly Stalingrad). The colony of Schilling (Sosnovka) was located about 34 kilometers (21 miles) to the east of Norka and was important because it had a boat landing on the Volga River. Given the distance from Norka to the Volga, it is unlikely that most people saw the river with any frequency. To the south were the smaller colonies of Huck (Splavnukha) and Neu-Messer which were part of the Norka parish. The nearest Russian village, named Rybushka, was located 16 kilometers (9 miles) northeast of the colony. The colony of Kolb (Peskovka) was located about 26 kilometers (16 Miles) southwest of Norka. The colonies of Walter (Grechinnaya Luka) and Frank (Medveditsa) were located approximately 37 kilometers and 35 kilometers (22 and 21 miles) due west of Norka, respectively. Throughout their history, Norka and Frank were two of the greatest rivals among the German colonies. Many good-natured stories were told which highlighted this underlying competitiveness. The Karamysh River formed the eastern and northern boundaries of the land belonging to the Norka colony, flowing from south to north and meeting the Medveditsa River to the northwest of the colony. The southern boundaries of the Norka land were formed against the Huck and Frank lands. To the north and west the Norka lands joined those of the Russian villages along the Medveditsa River. The Medveditsa converges with the Don River near the town of Serafimovich. The soil in the area around Norka is a light chernozem that is very fertile, unlike the sandy, clayey and rocky soils further south or in areas that were not near a river. 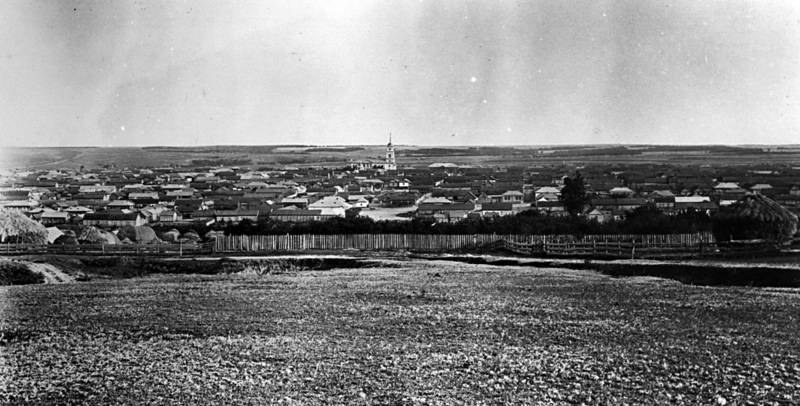 Norka was connected to the surrounding colonies and the city of Saratov by unpaved wagon roads. The trip to Saratov was difficult due to the length and the fact that travelers had to pass through a wooded area northeast of the colony called the Kosakenwald (Cossack Woods). The Kosakenwald was about half way between Norka and Saratov and the narrow road cut through a dense forest that were frequently inhabited by robber bands. Gruesome stories of what happened on these journeys were often told in the late winter evenings. Just south of the Kosakenwald was a small Russian village and a Gasthof (guest house) where travelers could get a meal. Norka was also located on the important Saratov to Don trade route (torgovyi trait) which was a key factor in Norka becoming one of the most prosperous and largest trading colonies. 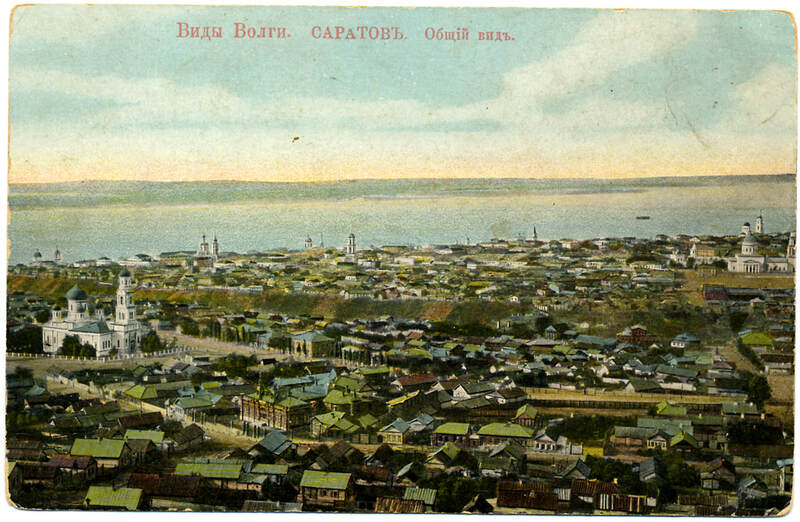 Postcard showing a view of Saratov looking to the southeast across the Volga River. Source: Steven Schreiber. The colony of Norka was situated on a sloping strip of land between two streams that rise from springs located in hills west of the colony. The streams flowed down from a height of about 260 meters (850 feet) and provided excellent sources of water. The hills were covered with forests of ash, birch, pine, and linden trees. In the early days, strawberries, blackberries, cherries, and pear trees could be found. The Norka Fluss (The German word Fluss translates to flow or river) originates from a spring 2 to 3 kilometers west of the colony and traverses the northern side of the village through what was called the Norkagraben (Norka gully). Water from this spring was used for the livestock. The second and larger stream called the Ella Born flowed south of 9th street through what was called the Borngraben. Part of this spring-fed stream was used to irrigate the privately owned fruit and vegetable gardens that lay along its banks. The gardens contained potatoes, cabbage, squash, watermelons, dill, carrots, beets, gooseberries, cucumbers as well as apple and cherry trees. Water from the Ella Born was also carried through the colony in pipes and at certain intervals wells were dug so that everyone could have clean drinking water. The meaning of the German word Ella is possibly from the Old German word Alia, meaning "All". The German word Born translates to spring. The Ella Born joins the Norka Fluss at the east end of the colony. A Staubecken (reservoir) was built at the confluence of the two springs, probably in the early 1900s. Between the Norka Fluss and the Ella Born, the colony extended by over 4 kilometers (2.5 miles) from west to east. There were nine rows for homes, businesses and schools and five streets running east-west to divide the rows. Numerous streets ran north-south and divided in blocks. Each block typically contained four households which included a homesite consisting of a house, several barns, and an open courtyard surrounded by a high fence and gate. Very few houses had landscaping as water was far too precious to be used in this way. All water was hand carried from wells located throughout the colony. The highest hills in the area were called the Galge Löcher (Gallows Hollow) and lay northwest of the colony. To the west were two canyons called the Pfaffe Graben (Priest's Gulch) and the Streit Graben (Disputed Gulch). The Pfaffe Graben was used for adult immersion by the Baptists and Adventists. The Streit Graben was once the scene of a boundary dispute between Norka and one of its neighboring colonies. Feeding into the Norka Fluss were several other Graben or gullies running north and south of the colony. Water was tapped and stored in several water tanks north of the Norka Fluss. There were at least nine bridges over the Norka Fluss, including the Spady bridge at the eastern end of the colony and the private bridge leading to Garte Krieger's property. There were two bridges over the Ella Born. The first was called the Russian bridge which carried the road leading due east of the colony. The second bridge was Hucker bridge which provided the main access to Norka from Huck, Dönhoff and Balzer. Several mills were built along the Ella Born by the 1920's, including those owned by Reicher (rich) Schleining, Poste (postman) Krieger and Peter Sinner. As the population grew over time, more land was needed for housing. The colony spread out from its center to the east and west. In 1880, the colony was divided into three sections: the Oberdorf (upper portion of the colony located to the west), the Mitteldorf (the original and now middle part of the colony) and the Unterdorf (the lower part of the colony located to the east). The pastor, school teacher, and the wealthier inhabitants lived in the Mitteldorf and the less wealthy people in the other two sections. There was always a certain amount of rivalry between these three sections of the colony. The church, parsonage, a school house, the cemetery, and a few stores were located in the Mitteldorf. In addition, on the north side of the colony there was a Kreis Amt or county courthouse, a fire station in which several horses, carts and necessary equipment were kept, and the colony jail which was called the Kalmucken Haus because the first offenders to inhabit the building were allegedly Kalmycks. A large ravine called the Gasse Grava ran north and south through the center of the Oberdorf and was too steep for roads to cross except on the north and south ends of the village. It should be noted that administrative districts (gubernia, uyezd, cantons, etc.) changed from time to time both in the Russian Empire and Soviet Union. Brill, Conrad. "Memories of Norka." Interview by George Brill. 1-16. Print. 1-16. Litzenberger, Olga. Deutsche Evangelische Siedlungen an Der Wolga. Trans. Johannes Herzog and Paul Höringklee. Nürnberg: HFDR, 2013. 441. Print. Long, James. From Privileged to Dispossessed. Lincoln, Nebraska: U of Nebraska, 1988. 276. Print. Olson, Marie Miller, and Anna Miller Reisbick. Norka, a German Village in Russia. Lincoln, Nebraska: American Historical Society of Germans from Russia, 1986. 8-13. Print. Sinner, Peter. "Orts- und Flurnamen," from Deutsches Leben in Russland, January 1923. The website wolgadeutsche.net which contains information about the administrative classifications for Norka (Russian language).